Please join Adam Boyd, the AACT Program Director, as he outlines the benefits for teachers and coaches in the Science Coaches program. Science Coaches is a joint ACS and AACT educational outreach initiative dedicated to enhancing science skills in students across the United States. The program partners coaches (volunteer chemists) with AACT teacher members in elementary, middle, and high schools. Teachers accepted into the program will have the opportunity to form a valuable relationship with a coach. Come learn about how the program can benefit you. Are you asked to incorporate reading and writing into your lessons to support literacy in language arts? We have the right strategies for you! Have you ever wondered if an AP Reader collects "insider" tips while grading the AP Chemistry Exams? 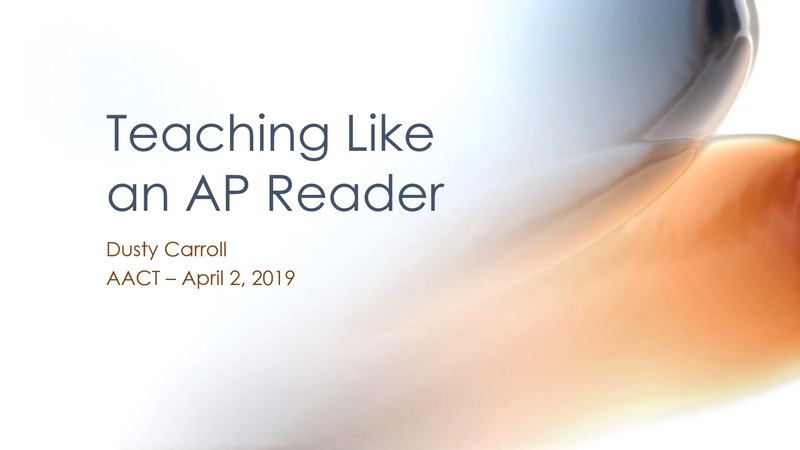 In this webinar, an experienced AP Reader and Table Leader shares tips that she has gathered during years of participation in the annual AP Reading. After scoring thousands of exams, some patterns emerge that help us realize student misconceptions when we least expect them. Dusty Carroll highlights several places throughout the AP Chemistry curriculum where simple changes in teaching focus can help to increase student understanding, leading to higher AP Exam scores. Most high school chemistry textbooks have a chapter on organic chemistry tucked away at the end of the book, but this is generally not covered in a first year course. This leads students to believe that organic chemistry is a mysterious realm where the known rules of chemistry don't apply. Suggestions for incorporating more organic chemistry into regular chemistry classes to illustrate concepts will be provided. As we gear up for the 2019 AP Chemistry examination, let us put to rest the confusion and controversy that surrounds the “mole of reaction”. Virtually ignored in many textbooks, the mole of reaction is both a fundamental idea and a useful pedagogical tool. This presentation will examine the rationale behind the mole of reaction, its history on the AP exam, and discuss strategies on how to incorporate this critical concept into your classroom throughout your AP course. 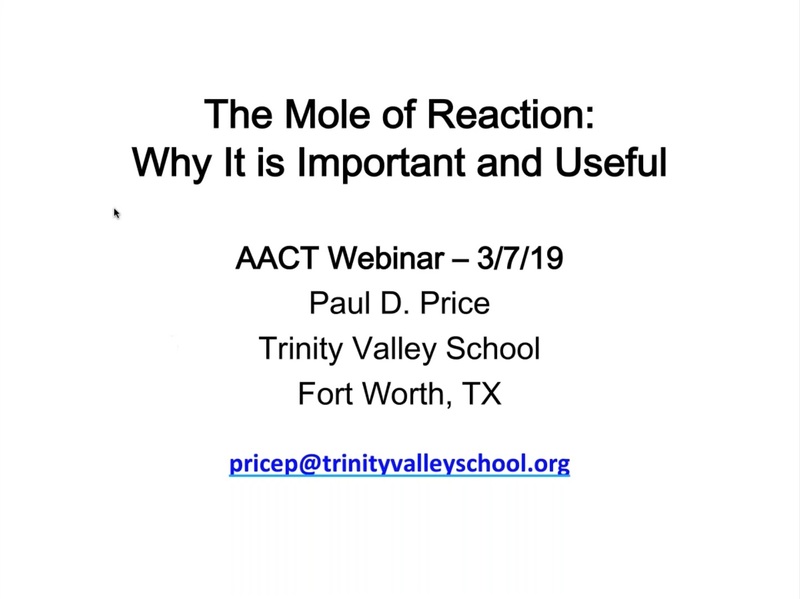 The first hour of the webinar will focus on the mole of reaction topic and will be followed by a 30 minute of Q&A focusing on reviewing for the AP Chemistry Exam. 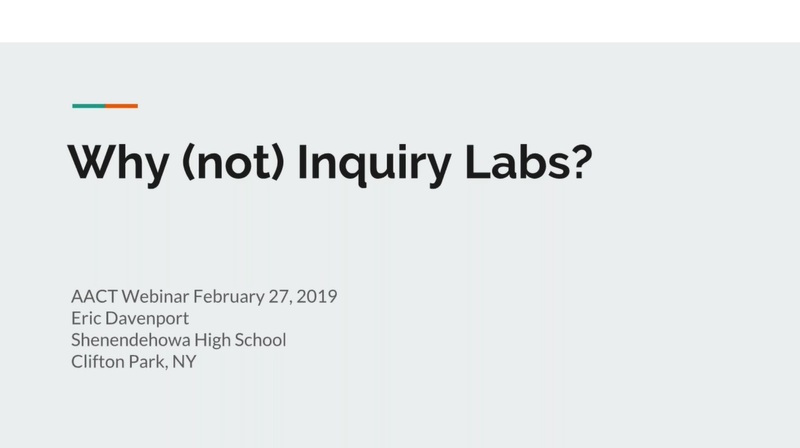 Lab & Safety, Teaching Methods, Teaching Resources | February 27, 2019 Why (not) Inquiry Labs? It's easy! How do you make a rainbow cylinder? What ratio of hydrogen:oxygen is most explosive? How do we unmix it? What part of the flame is the hottest? These are the questions that drive inquiry-based labs. The standard for labs in many classrooms is still the packet with pre-lab introduction reading, some basic pre-lab questions, a prescribed procedure, pre-formatted data table, banal conclusions questions and probably some exam practice questions to finish it all up. Student thinking, writing, and learning is minimal. If your school or state mandates a minimum number of hands-on lab minutes, these meet the requirement and have little other benefit. Students truly enjoy these cookbook labs about as much as teachers enjoy grading them. So why keep doing labs this way? With a few changes in mindset, both teachers and students can turn almost any cookbook lab into an inquiry learning lab that is rich in writing and thinking. This webinar will provide examples of old cookbook labs, from easy to difficult, that are successfully converted to inquiry labs. An example lab report template based on Google Slides will be shared and some advice on useful grouping strategies will help teachers transition their lab assignments to something closer to inquiry learning that aligns with NGSS and State standards derived from the same. A strong honors/chemistry 1 curriculum can be one of the most powerful tools in boosting AP scores. 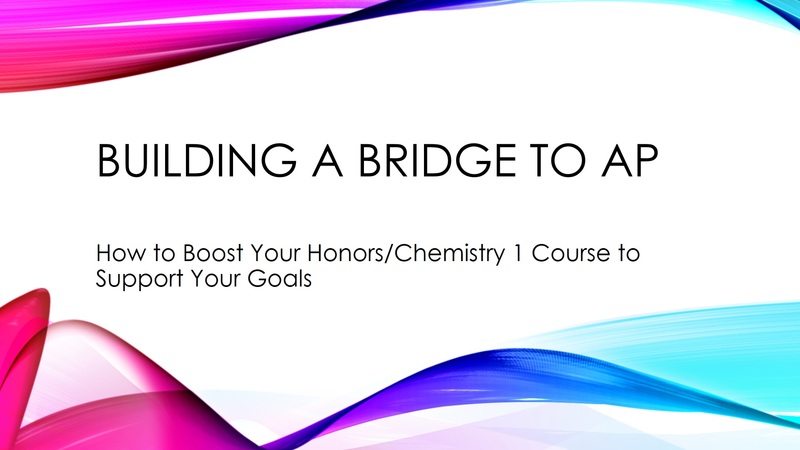 This webinar will focus on ways in which reverse designing the curriculum in honors/Chemistry 1 can emphasize content and lab skills to save time during the crunch of an AP Class. In addition, tips for boosting enrollment and rapport in AP by establishing enthusiasm and expectations will also be discussed. As science teachers, we routinely ask our students to explain their understanding or provide conclusions from the evidence they had gathered. However, we are consistently reminded that the majority of our students do not make the connections in their explanations or conclusions that we had hoped for. Writing quality scientific explanations is a skill and it is up to teachers to help students develop that skill. Fortunately, there is a framework that is gaining momentum among science teachers, which is designed to help teachers specifically target and develop this skill. Claim, Evidence, Reasoning. Conducting experiments with materials that can be obtained at local grocery and retail stores provide a variety of advantages to chemistry teachers. By using commonly found items in experiments and demonstrations, teachers provide students with familiar and natural connections to investigations in chemistry. Such materials are generally convenient to obtain, allowing teachers to acquire supplies only a few days (and in some cases a few hours) prior to conducting lessons. In this presentation, several experiments and demonstrations that illustrate the chemistry of common materials will be explored. Why did Gandhi hate iodine? Why did the Japanese kill Godzilla with missiles made of cadmium? How did radium nearly ruin Marie Curie’s reputation? And why did tellurium lead to the most bizarre gold rush in history? The Periodic Table is one of our crowning scientific achievements, but it’s also a treasure trove of passion, adventure, betrayal, and obsession. The Disappearing Spoon delves into every single element on the table and explains each one's role in science, money, mythology, war, the arts, medicine, alchemy, and other areas of human history, from the Big Bang through the end of time. Please join us as we kick off the International Year of the Periodic Table with a special presentation from Sam Kean, author of The Disappearing Spoon, Caesar’s Last Breath, The Tale of the Dueling Neurosurgeons, and The Violinist’s Thumb. Using a variety of strategies and techniques, chemistry teachers can help ensure that Special Education students can be fully integrated into the class and access the curriculum even if students have weak math skills or learning challenges. Learn how to provide scaffolding for your students to create models and construct explanations of phenomena using fool-proof strategies. Ideal for any teacher new to using phenomena in the classroom. Keeping in touch with former students, many of whom can be an asset to your program, can always be challenging. Teaching at a magnet school, where the majority of our students are not based in the neighborhood where the school is located, can be even more challenging. Learn how a British tradition that dates to the early 1800’s helped to shape one of the year’s most anticipated events at our school. Learn how we encourage our current study body to interact with alumni through a yearly chemical demonstration event. Does the wonder of space engage your students? Would they be surprised to find all of the ways chemistry applies to the study of our solar system and beyond? Join Michael Romano, a fellow chemistry teacher who just completed an Einstein Fellowship at NASA, as he shares numerous ideas for bringing space topics into your chemistry lessons to celebrate "National Chemistry Week 2018: Chemistry is Out of This World." Are you looking for phenomenon to engage your students in chemistry? Join Jessica C. Levine and Emilie Mosko, middle school physical science teachers, to see how existing chemistry curriculum can be easily modified towards an NGSS storyline. Presenters will highlight their lesson design of a groovy phenomenon to engage students in chemistry concepts such as density, heat transfer, particle motion, and phases of matter--The Lava Lamp. Join Jenny Bishoff to learn how you can use AACT resources to create a safer chemistry lab environment. As teachers begin the school year, planning often involves a focus on assessment. Multiple-choice questions are commonly used on chemistry tests, despite the fact that many teachers have never been trained in how to write them. AP chemistry teachers face the challenge of finding multiple-choice items that are similar in style and format to those that appear on the AP exam. The theme of this webinar is the process of writing items that emphasize conceptual understanding and higher-order cognitive skills. Co-presenters Michael Farabaugh and Linda Cummings have experience as both AP readers and item writers for the AP exam. They will not only discuss techniques for improving the quality of existing questions but also provide suggestions for how to get started when writing your own. 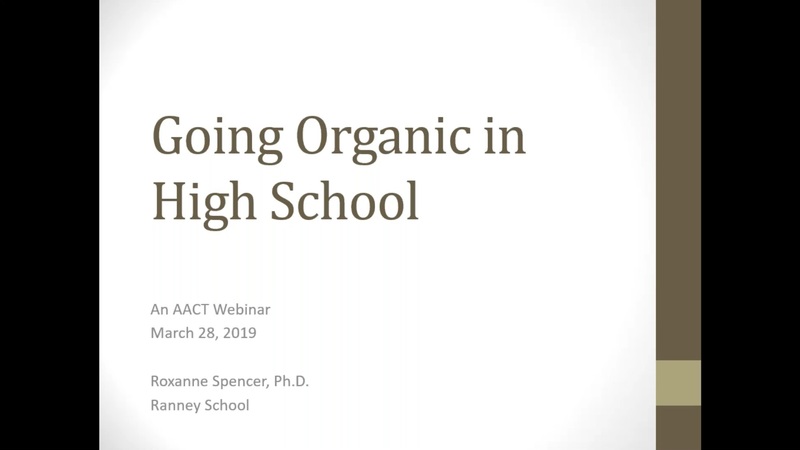 Although this webinar will be beneficial for teachers of AP chemistry, it is intended for any teacher who wants to learn more about the construction of multiple-choice items. Participants will have the option to submit two original multiple-choice questions after they register. Some of these questions will be used as examples during the webinar. Come join us for a presentation that promises to be (A) informative (B) valuable (C) relevant (D) all of the above! Have you ever wondered about the benefits of being a member of the AACT? Discover how AACT membership can enhance your experience in the chemistry classroom. Join AACT President, Sherri Rukes, Past-President, Jenelle Ball, and President-Elect, Heather Weck, as they guide participants on a virtual tour the AACT website. All resources will be unlocked during the webinar so that attendees can follow along with the presenters and see all of the valuable classroom materials available to AACT members. This webinar will be particularly valuable to teachers who are considering becoming a member of AACT or members who might not be familiar with all of the classroom resources that are available on teachchemistry.org. It’s also a chance for current members to learn about the additions and updates that we’ve made to our website and member benefits. During this webinar, Paul Bonvallet, Chief Reader, will outline the logistics and scoring process for the 2018 AP Chemistry exam and discuss practices for consistent, fair, and accurate grading of the free-response section. The presentation will then review in detail all the free-response questions from the 2018 AP Chemistry Exam and highlight the most common student misconceptions revealed during the scoring of the test papers. The presenter will suggest several teaching strategies to address these common misconceptions in the classroom and in the teaching laboratory. The webinar will include information on the application process for becoming an AP Chemistry Reader. The Albert Einstein Fellowship brings K-12 STEM educators together from across the country to tap into their experiences to shape and lead the conversation around STEM at a national level. During this webinar, Einstein Fellows and alumni will share the unique experiences they have been granted with fellow educators, discuss what they’ve learned about teacher leadership, and provide some insight into a day in the life of an Einstein Fellow. Hear Erica Posthuma-Adams and Ryan Bruick talk about incorporating modeling instruction into the high school chemistry classroom.